It is just under a 2 hour drive from the little village, Ponte a Seragglio where we were staying in Bagni di Lucca to Greve in Chianti. So we set off early one morning in our little Fiat 500 for the trip up to the Chianti area in the Tuscan Hills. It actually took us twice as long to arrive to this gorgeous little town as we stopped a couple of times along the way also my navigation system failed. However, the stops were so worth it. The drive up to Greve in Chianti was wonderful with breathtaking views of the Tuscan Hills. We stopped many times to admire the vineyards on the hills and take photos of the magnificent panoramas that the Chianti offers. 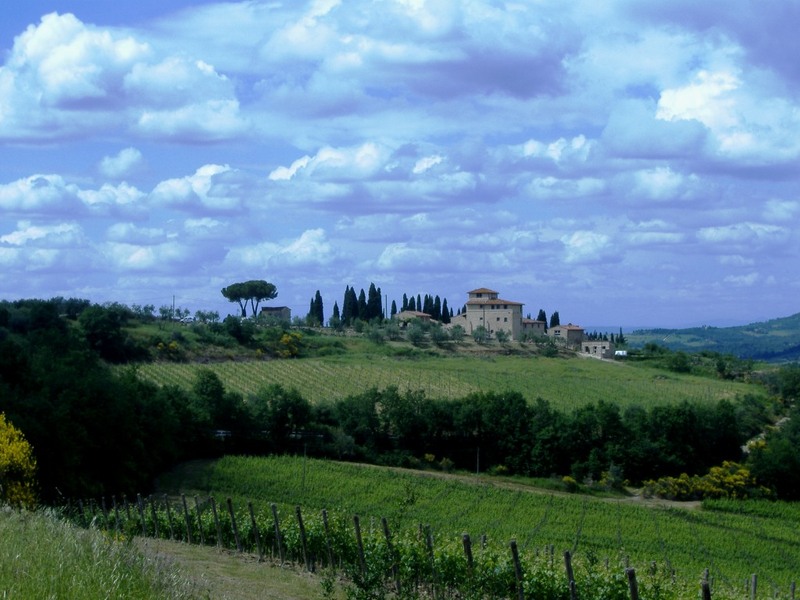 This Chianti area is one of the most beautiful areas in Tuscany. Many of my photos remind me of postcards and calendars that I have seen of Tuscany. Greve in Chianti is often considered to be the entrance gate into the Chianti region since it is the first major town you reach as you head south of Florence toward Siena. It is located along the SR222 provincial road, locally known as the Chiantigiana Road, and is about 30 km south of Florence and 40 km north of Siena. 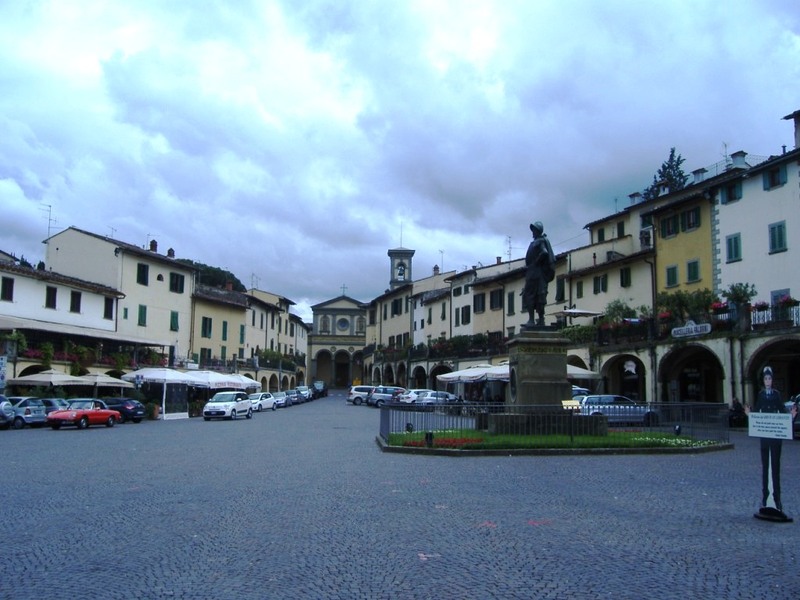 Piazza Matteotti is the main piazza in Greve and even if it isn’t “square”, it is still the focal point of the town. This main piazza was a perfect location for us to wander around. You can enjoy a coffee, gelato, a glass of wine, or for us it was a delicious lunch. We arrived about lunch time so after a leisurely walk around the piazza and stopping to look at several menus we chose our restaurant for lunch. I must say, it was not easy. There are several bars (coffee shops), wine shops, restaurants and pizzerias in the main square and in the small streets around the main square. The menus all appeared to be meals of local Tuscan cuisine. Wandering around this unique piazza was so easy and delightful as there is a portico or covered walk way framing the shops which sell the local produce, the artisan shops and the restaurants. Although the weather on this particular day was perfect I can imagine this portico would be wonderful on a hot summers day or in fact would probably give some relief on cold days. We stopped in to many of these shops. Sometimes we just looked and in other shops we purchased. Here are a few of these lovely shops. We left Greve in Chianti later in the afternoon and headed over to Siena. The easiest way to move around the entire region is by car, and one of the most scenic roads to take is the Via Chiantigiana from Florence all the way to Siena. 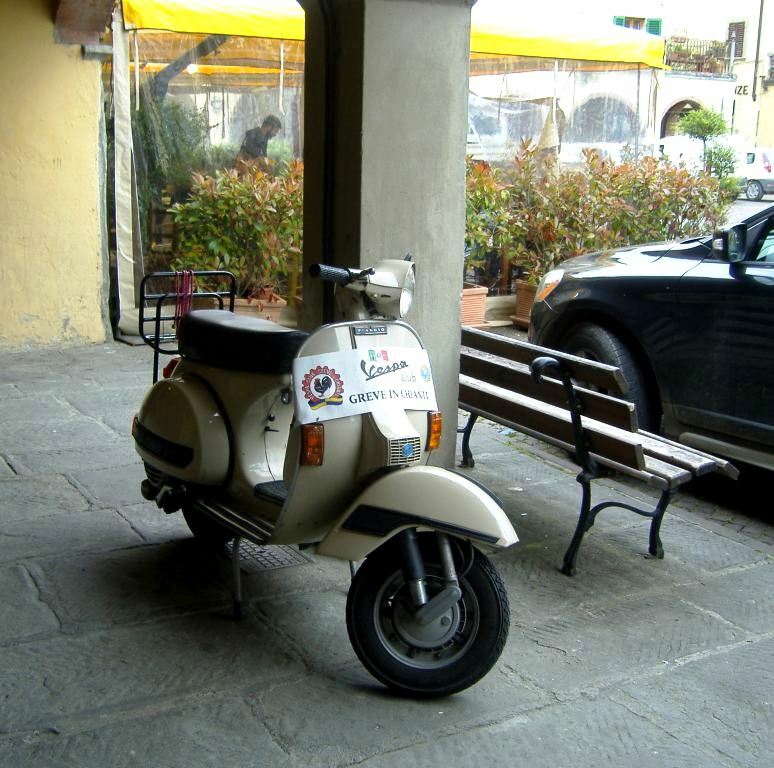 If you don’t have a car, Greve is luckily one of the easiest towns in Chianti to reach from Florence. You just need to catch bus 365 from the SMN train station. How do you like the car? how is it on gas? Would you believe, next month we’ll be there and driving one also. Don’t plan on using GPS, will just use maps. Thanx Janet, the car was great. We got it at a good price but I actually did not have GPS as it was an extra $11 per day. My GPS was my passengers. There were many many steep narrow winding roads in the area and the car handled them beautifully. I actually really enjoyed driving it. I hope you enjoyed some of the local chiani wine. The photos are wonderful. Yes Donna we did enjoy the local wine. We always have a glass or 2 with lunch and dinner and it is always the local wine. Always fabulous wine. Gorgeous photos & yes it must have been like being in a living postcard. Kay. Thanx Kay, It was so beautiful, I could not stop taking photos. Such a bful place!! I went to Montespertoli in Chianti area :) Must b nearby..
Oh, driving in Italy, what an experience! One of my first posts was our experience in Montepulciano and the roads! Loved it! I really enjoy driving in Italy. Especially in the regional areas. Love those narrow, winding roads through the beautiful country side. Gorgeous pictures – love the sound of the drive up to Greve and those views look stunning.Also like the sound of the drive from Florence to Siena – one for our next trip maybe!! Lynn, we loved this village. We stayed in an apartment right above the butcher shop. It was so fun to sit on the balcony and watch the goings on!